What has NIWA done to the original raw temperature readings? What do the adjustments look like? I can do little better than to show them on a single graph. The official NZ temperature graph showing both the raw readings and the effect of NIWA’s adjustments. Click for larger version. 1. The original readings show a slight, insignificant warming. 2. The adjustments have the effect of cranking the older readings down so the trend is now one of strong warming. Indeed, it is 50% greater warming than the globe itself. Just as our original paper showed, back in November 2009, New Zealand has indeed been the subject of man-made warming, but only by adjusting the figures. Still, to this very day, NIWA refuse to detail the adjustments they made and why they made them. They have had every opportunity to do this, as we have asked again and again. But they have met us with prevarication, obfuscation and diversion. They sent us to scientific documents where we found no mention of the methodology. They described in detail altitude adjustments where weather stations had moved and suggested we knew nothing about the realities of measuring the temperature and the adjustments that are often required; but it turned out that none of the weather stations were adjusted for altitude changes in the way they said. In other words, they lied to everybody, in the newspapers and in the Parliament. Finally, NIWA essentially agreed that they could not justify the adjustments, they didn’t even have the adjustments and therefore they would create a new temperature series from scratch and have it peer reviewed and publish all the data. This they have not done. But in the meantime they continue to publish, quote and recommend this “temperature record” which they cannot justify. We believe they ought to withdraw it, and our only recourse now is to ask a judge to order that they withdraw it. The coming weeks will be interesting. Hide the decline all right! Bring on prosecutions for fraud. Behave; where’s the evidence? It’s too early for prosecutions for anything. Even our exhaustive study of NIWA’s production of the NZ temperature record hasn’t turned up anything more than annoying misdirections and obfuscations. There’s nothing remotely unlawful. Unless it’s against the law to be extremely irritating, we aren’t alleging illegality. Yes you are right as in the sense it would have to be proved to be deliberately fraudulent. Note Viscount Monktons attempts to get Phil Jones done for breaches of the official information act and Al Gore prosecuted for fraud over his film. This article is interesting in a number of points, in that they find some faults in McKitricks analysis. i,e no partisanship, just honest science. As we’ve argued before, the real issue with temperature series is the metadata, its related microsite and UHI issues and adjustments made prior to entry in the GHCN database. Absolutely wrong, they have made no such statement. In answers to questions in the Parliament, NIWA gave no reasons for the adjustments. In reply to an Official Information Act request, they provided no reasons for adjustments. Then in February this year they announced they would “recreate” the temperature series from scratch, with a completely new schedule of adjustments. This was a tacit admission that they could not justify the original adjustments made by Jim Salinger — they had to do it again; they started with Hokitika. The link you provide is interesting, but gives no actual reasons for adjustments that were actually made at any of the stations. The information is not wrong, but it is not what we asked for. We asked what adjustments were made and why. You might like to know, too, that the citations they gave us to scientific papers, and which they have now published on their web site, do not have enough information to replicate Salinger’s adjustments, nor do any other scientists use the methods they describe. That explains why Mullan’s analysis of Hokitika is different from Salinger’s version, in his 1981 thesis. If even NIWA’s own scientists cannot replicate Salinger’s work, why do they say we should be able to? In fact they cannot even describe Salinger’s methods, which have never been published, peer reviewed or used elsewhere. NIWA was never in a position that they could not justify their adjustments. That’s just hypothetical nonsense. The adjustments that they make are for the most part well understood and trivial. Ok. I’d like to believe that, too, because I’m proud of the institute and what they’ve achieved in various fields. But, if they could justify their adjustments, why didn’t they publish them? It’s one thing to say you can justify them; it’s another to state those justifications. We want them to state the adjustments, with reasons. They had the chance when we first asked for them; they had the chance when questions were asked of Nick Smith and Wayne Mapp in the Parliament and they had the chance when we sent an Official Information Act request to their lawyer. But they never published the adjustments. It isn’t nonsense, Chris. We couldn’t make this up — it would be too easy to refute. All they have to do is publish a list of the adjustments with their reasons. Do you wonder why they haven’t done this? For one thing, it would at least make the Coalition shut up! Again, you quote their web site “giving reasons” for the adjustments. But where do they say that those specific adjustments were actually applied to the actual NZ temp series? I’ll tell you: nowhere! They may well be trivial changes. So let’s hear what they are! These NIWA ‘explanations’ have already been assessed, and there are some obvious problems. First of all, let’s look at Wellington. While the Kelburn/Airport argument appears to be reasonable, NIWA have since confirmed that they did in fact not use the stated altitude adjustments anywhere in the series. So much for that. I would add that the reason they don’t use the altitude adjustment method is it’s fraught with problems. Hokitika Southside is lower than Hokitika Aero, yet a glance at their relative records shows Aero to be warmer than Southside during the overlap. Explain that. (Possibly it’s to do with colder air flowing down the valley). So altitude is not just cut-and-paste as NIWA (and you) imply. Another argument comes directly from the Auckland example you cite: surely you noticed that Albert Park is higher in altitude than Mangere? Yet we’re told it’s a full 0.6ºC warmer? Are you still happy to blindly accept the ‘adjustment due to altitude’ argument? Regarding Auckland, and the Albert Park/Mangere example: yes, it’s true that during the period of overlap, Albert Park is warmer than Mangere by 0.6ºC. How is that, since based on its altitude it should be cooler? Well the answer is found in J.D. Hessell: “Apparent trends of mean temperature in New Zealand since 1930”, NZ J. Science,(1980) , where Hessell specifically examines Albert Park, and shows convincingly that urban effects have slowly raised the temperatures at the site. This is because tree growth caused a sheltering effect, proven by the wind speed records at Albert Park relative to Whenuapai. There are also other urban effects, as anyone who has visited Albert Park and Mangere knows. Therefore, it is not valid to simply drop the whole of the Albert Park record down by 0.6ºC, since we know that the effect was a slow and gradual one, starting in the 1930’s when the trees began to have an effect. Once again, I feel it’s worth restating the obvious: If NIWA know in detail the actual adjustment reasons and magnitudes at each point for these station histories, why have they not simply published them, and why have they requested funding for a project to reproduce the adjustments? So where are the standard errors? Why is the series regarded as ‘clean’? Why did NIWA not even inform the public that there were any adjustments, until the Coalition made it known? Your right, NIWA did not use altitude adjustment directly. What they did was normalize data to a baseline weather station, which in the case of Wellington meant that all the data was normalized with respect to Kelburn station. This is not explicitly an altitude adjustment, because they didn’t apply an altitude lapse rate correction. “The offset of 0.8°C used in the webpage illustration agrees with what we would expect for the altitude difference between the sites, based on the free atmosphere lapse rate of 0.65°C per 100 metres”. In other words when they normalized the data they found it was in good agreement with what you might expect for two sites at an altitude difference of 125m. Accept, yes. Accept blindly, No. I just don’t understand what your getting at here. Are you trying to say that the free atmosphere lapse rate doesn’t exist. If you are, then I suggest going up a mountain in your “T-shirt and shorts”. Also yes Mangere is a whole 20m lower than Albert Park – big deal. This would mean based on altitude alone you would expect a difference of only 0.13 degrees between the two sites. So altitude is obviously not the dominant factor between these stations. Fortunately we know that altitude is not the only reason for adjustments. In fact the free air laspe rate only applies in free atmosphere away from the ground. Which is why they primarily normalize data rather that apply corrections directly. Next point. You quote “If NIWA know in detail the actual adjustment reasons and magnitudes at each point for these station histories, why have they not simply published them”. Once again I am very confused by your comment. You can download all the data and adjustments for the seven station series directly from their website. I have done this and had a look at their data. It all seems reasonable to me. You might be missing some of the history here. The first point is that originally, when challenged to provide the adjustments, NIWA did some scurrying around, since they didn’t know what they were. The first “altitude” page they produced stated explicitly that the reason they reduced Thorndon was that it was at a similar altitude as Wellington Airport. The reasoning went like this: Kelburn is the reference station. Airport (not used in the series) is warmer than Kelburn by 0.8ºC during the overlap. This makes sense, because of the lapse rate of 0.65ºC/100m. (Of course it only makes sense if Kelburn is hovering in mid-air, but let’s not go there). Now we know Thorndon is at roughly the same altitude as Airport. Ergo, we feel justified in reducing Thorndon by 0.8ºC to bring it in line with Kelburn. Salinger himself repeated this at a talk attended by one of our members at the time. So then, what about the other Wellington stations? What about Knowles Observatory, Bowen Street and Buckle Street? There were no overlaps with Thorndon, so why were they adjusted downwards too, if altitude is not the factor used? Clearly, they are working it out as they go. The main point is that originally, they did argue that altitude was the sole reason for linking Airport and Kelburn. The NIWA page you’re reading now is not the original. Many of the original response pages have been removed or changed. I’m not arguing that there is no reason for the adjustments, or that NIWA can’t or won’t come up with some. I’m simply saying that NIWA didn’t know what they were when they were challenged. The main point is that NIWA have a duty, as the designated advisers to the government, to ensure that their data and methodologies are known and internationally acceptable, can be produced at any time, and are sound. I’m sorry, but I’m not seeing any of this right now. I’m seeing an organisation scrambling to reverse engineer the reasons for the adjustments, clearly because the reasons for original adjustments by Salinger were subjective and are now undocumented. With time, I’m sure NIWA will come up with reasons for all the adjustments. The salient point is that right now they cannot produce them all. Maybe they have something new. Please give a link. What specifically do you mean by “the data and adjustments”. If you mean the data, and the adjustment magnitudes, then yes, they have now published that (after the Coalition’s paper, and <b.after they were asked many times for it). Of course, the Coalition had already worked these out for themselves, and there is no mystery there. It’s easy enough: simply compare the raw vs adjusted data. However, they haven’t published the full set of reasons for each adjustment. And the reasons they have published keep changing, or don’t use techniques in Salinger’s thesis. Instead, they have acknowledged that they don’t have the reasons, they were lost, and that they will need funds for a new project to re-engineer them. I’m not sure therefore why you’re arguing that they have published them, when NIWA themselves aren’t saying this. The line “The main point is that originally, they did argue that altitude was the sole reason for linking Airport and Kelburn. should read “The main point is that originally, they did argue that altitude was the sole reason for linking Airport and Thorndon. “Instead, they have acknowledged that they don’t have the reasons, they were lost, and that they will need funds for a new project to re-engineer them”. Who said this??? Please give me a name of the person in NIWA who said this so I can contact them and ask them if this is what they said. Chris – you have to realise that people like Richard are not concerned with the truth. He started by claiming there was no need for adjustments. This claim was circulated world wide (he was proud of that) and has been thoroughly discredited. He will now acknowledge that adjustments are necessary but refuses to withdraw, or apologise for, his original report. Obviously becuase they still want to use it politically (this won’t look good in court, will it). After NIWA produced adjustments they then went on to demand the weirdly named “schedule of adjustments” – actually the pieces of filter paper and backs of envelopes and other scraps of paper used for the original calculations (before the time of widespread computer use). Richard and his mates attempt to confuse the issue by covering up the fact that methodologies are available in published papers and Salinger’s thesis. The raw data and station information is available. He and his “anonymous science team” (strange that) could do their own calculation of adjustments. That is how science is validated and reproduced – not by checking through the minute details of others’ calculations. 1: An honest calculation would most probably produce very similar results to that used by NIWA. 2: It would make even more public nonsense of their original claim (still being used in their propaganda) that adjustments were not necessary. This court case is going to be interesting. I can see them preparing their “whitewash” placards already. Yes, the “original worksheets” used by Jim Salinger for his PhD study in the late 1970s have indeed been misplaced, or possibly destroyed. However, the original data upon which his calculations are based are still in existence. One could read this to mean simply that the original temperature data survives. Certainly the net changes are known and it is only the reasons that are missing. It’s not a question of “calculating” anything now, but of explaining what was calculated in the past. I’m not sure about the announcement of the project. Maybe Bob can look it up. But wait! I’ve asked some questions you haven’t addressed yet, and there are more from Bob (although you’ve assiduously addressed his earlier points). What are your thoughts about the other things we’ve said? I believe that his statement is backed up by other Parliamentary questions & answers. What does this mean? Simply put, it means that the original data still exists, but not the calculations. We know this, because the data is in the CliFlo database. What is missing is the point-by-point rationale for each adjustment (the calculations used to combine the series from the component stations). That is what is being re-created. An example of a re-creation is Dr Mullan’s Hokitika series document, which lays out in detail the reason and magnitude for each station adjustment for all the Hokitika stations. Note though that Mullan’s calculations do not seem to use the same approach as Salinger’s thesis, nor the 1993 paper by Salinger, and this raises new questions. Note also that even though they said in December 2009 that they would publish the full set of calcs, this hasn’t happened yet, and it’s almost September. At the end of the process, a comparison with Salinger’s time series will be done, to see whether they match. I submit that in fact it will simply be a reverse engineering process, and the graphs will almost certainly match, because that is what the aim is. However, at least at the end we will all have a temperature series that we can look at and agree or disagree with based on actual evidence, not just on a “believe us we’re NIWA” approach. 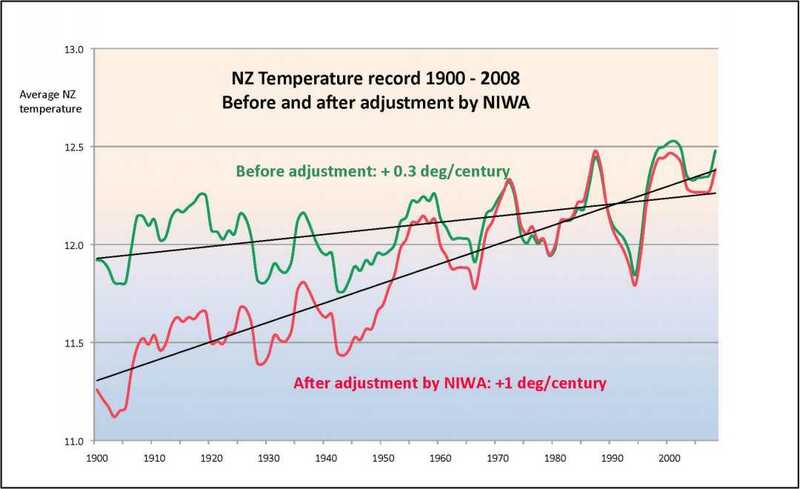 If of course they end up with exactly the same graph, the next obvious question is: “By what means is it likely that NZ land has warmed 50% more than the rest of the world (0.9 vs. 0.6ºC/century), especially in light of the head of NIWA’s own assurance to Nick Smith that NZ should warm less than the rest of the world, due to the moderating influence of the ocean that surrounds it?” There seems to be a direct contradiction here. However, this is peripheral to the main issue here, which is: at the time of the challenge, NIWA did not have the calcs even though they said they were in the public domain; they tried to make out the Coalition was dishonest because the Coalition was familiar with the calcs (even though NIWA itself wasn’t, as it turns out); and now they are having to re-create the calcs anyway. Chris – have a look at When Asses go to law. This will update you on the court case. The situation is that, having lodged a document in the Auckland High Court, we await NIWA’s response. If we arrive at some kind of agreement together, the matter won’t reach court; if not, one party or the other might apply for a hearing. Bob, if you and your mates have any doubts about the integrity of the NIWA calculations you have all the data enabling you to do your own. This is how science validation works. Simply checking through calculations is not verification. Your question “By what means is it likely that NZ land has warmed 50% more than the rest of the world”. It is in the nature of a mean global temperature change that some regions will exhibit larger increases, some smaller. So any difference is hardly surprising. Another huge factor is the actual statistical variability in the data. I imagine the use of only 7 NZ stations , compared with the huge numbers included in any determination of global means, will produce far bigger standard deviations. However, this is really irrelevant (or of only academic interest). New Zealand has obligations derived from the IPCC assessment of global climate changes. The specific regional changes in New Zealand are irrelevant. As for dishonesty of the coalition. Surely there claim that no adjustments were necessary, and that NIWA artificially introduced adjustments for the sole purpose of producing a warming effect (that is the NIWA scientists were guilty of scientific misconduct) was blatantly dishonest. This argument of the coalition was rejected at the time. Their report was discredited. Yet they still promote it for political purposes. In my book that is dishonest. I am familiar with averages, thank you. I understand that some regions may be higher than the average while other regions are lower. It is however not my claim that the NZ region should be lower. It’s the claim of the Head of NIWA, Dr David Wratt. So why is it higher? That’s all I asked. Do you have an answer for that? Do you disagree with Dr Wratt? If so, why, and what are your qualifications for calling him wrong? If not, why do you believe the NIWA graph? Doesn’t it worry you? Yeah that was my point. There is no court case and I doubt there ever will be, because as far as I can tell there have been no laws broken. Isn’t that the point of a court of law – to actually uphold law. If people are so sure that the temperature record is invalid or contains spurious adjustments, why not just do the science and publish a paper showing the reasons. It should not and will not be decided in a court of law. “as far as I can tell there have been no laws broken”. With great respect, Chris, it is not germane that you cannot tell whether laws have been broken. You haven’t been called upon to make that judgment, and haven’t heard the evidence. In fact, you even seemed unaware that the documentation supporting the official temperature record had been destroyed. And you make the startling claims that “there is no court case” and that “it will not be decided in a court of law”. These seem to be very dogmatic assertions for one unskilled in the black arts of the law! With great respect, how would you know whether I am skilled in the “black arts of the law”. I wasn’t making a judgment of whether a law had been broken. I was making a statement that there isn’t a law that exists which prohibits losing (if indeed is was lost) a 40 year old set of adjustments! Let’s not forget that the documentation you are talking about is so old that in was written well before the knowledge of existence of global warming. It would hardly have been kept under lock and key. If people are so sure that the temperature record is invalid or contains spurious adjustments, why not just do the science and publish a paper showing the reasons. I for one applaud the NZCSC in its efforts to make NIWA account for an obviously shoddy and biased representation of NZ temperature records. It is about time NIWA addressed the matter and it speaks to their moral poverty that it takes a court ruling to force them to do so. Bob: “So why is it higher? ” – Well one thing I have learned about science is that evidence counts. When we discover a fact that doesn’t fit with our theory we know we are making progress. We can adjust our theory or develop a new one. In this case, of course, the evidence from 7 stations may not be sufficient to get excited about. And it is irrelevant to this whole issue in that government policies are based on the scientific findings of global warming – not restricted to NZ at all. ” As for dishonesty of the coalition. Surely their claim that no adjustments were necessary, and that NIWA artificially introduced adjustments for the sole purpose of producing a warming effect (that is the NIWA scientists were guilty of scientific misconduct) was blatantly dishonest. This argument of the coalition was rejected at the time. Their report was discredited. Yet they still promote it for political purposes. This might upset you but it is something the coalition will have to face in court. And it could have serious consequences (eg awarding exemplary expenses against them) because it indicates malicious intent. What’s your reference for that, please? Well, well – “the evidence from 7 stations may not be sufficient to get excited about”. Ken, do I detect a desire to downplay the NZ temperature record and start talking about something else? Now, there’s a change of goalposts! I would have thought there were several laws limiting reliance upon long-lost or badly-flawed Government documents. I think all Government departments are obliged to keep full and accurate records of information used for policy-making. I see Richard has put up a new paper today, which deals with “spurious adjustments”. I haven’t read it properly yet, but it seems to raise a lot of interesting issues about the validity of the official temperature record for Hokitika. NIWA should stop using that record. You’re right. I don’t know about lost or flawed documents, but the Public Records Act tells public bodies what they can do with their records. Or not do. For anyone wanting to defend or succour NIWA, it’s a minefield. They have done much more than engage in “spurious adjustments”. You’ll love it. According to that link just above the documentation was lost in 1983 before global warming was even known to be an issue. I thought you said the doc’s were deliberately destroyed, implying some kind of conspiracy – Mmmm. I don’t believe I said that. What’s your reference? Have you spoken with James Renwick yet to confirm what he said? Can you offer an hypothesis to explain New Zealand’s warming during the 20th Cent. apparently 50% more than the globe, though David Wratt advises we should expect less warming in future because of the moderating influence of the ocean (therefore why not also in the recent past)? Have you a reference to NIWA’s website statement of “2 sigma uncertainties of station data”? With respect, Chris, if no reasons are mentioned, how do you conclude that any adjustment is “reasonable”? How do you compare it with others if you don’t know why it was made? Regardless of how or why the calculations were lost, the fact that we have a temperature series containing adjustments that are now unknown and impossible to replicate should concern any reasonable scientist. They might have been lost in a fire — the mere loss is reason enough to recreate the series. The fact that it’s taken a prolonged public campaign in and out of the Parliament to force NIWA to move on it rings all kinds of alarm bells. Over the 100-year period from 1909 to 2009, the least squares linear trend for the composite ‘Wellington’ annual temperature record is +0.79 ºC, with an associated 95% confidence interval of +0.49 ºC to +1.10 ºC. Similarly for Auckland and Hokitika. As I have said before, most of the adjustments NIWA does are normalisations of data between neighboring sites, therefore adjustments are largely trivial. I have said, I downloaded their data for each site and looked at the adjustments they have done – have you tried this?. The vast majority of adjustments appear to be normalisations between stations. The graph you have shown at the top of this page contains two data series. One series is raw, unadjusted, data – correct. The other is the data modified by NIWA – correct. Now I have a huge problem with you displaying the raw data -as you have done- as a single data set, because it’s not. The raw data set you have shown comes from many different sites in different temperate locations and appending them together as a single time series without correcting the data first is just a total nonsense. If you really want to show a cooling trend plot Mangere for the first 50 year of the century and then pick a station on the central plateau and append it to the mangere data for that last half of the century. This would probably give you similar rubbish to the uncorrected data you display on the graph at the top. The illustration at the top of this page is just a misleading farce. I would also like to invalidate another point that you like to use. You and others complain that of all the adjustments made most of them are positive and that if NIWA were unbiased then you would expect a 50-50 positive and negative adjustment ratio. Why do you assume it should be 50-50? Because the majority of adjustments are for a change in site. The real question you should ask is – what are the reasons for relocating a weather station. The reasons are mostly to do with getting away from built up areas to make the station less prone to very localised heating. This typically means moving the site to a more exposed and often higher location – hence a positive adjustment. Australis, no you don’t detect anything because you are not listening. You have a preconceived position. My comments on seven stations is purely scientific. But of course irrelevant to what goes on in this blog which is political, not scientific. However, government policy is based on the IPCC findings. These are that global temperatures are increasing. Changes over the last 50 years cannot be explained by natural causes. Human actions are most probably (<90%) responsible for this recent increase. Local records could show an increase, decrease or little change in temperatures. This would not effect one bit our responsibilities or the likely effects of global temperature changes on wither our country or the rest of the world. How can people be so thick as to claim that the temperature adjustments are “impossible to replicate”? How? That is just so obviously stupid. Anyone with a few neurons to rub together can access the raw data. They can access the station records. They can access the publications describing the different methods for obtaining credible adjustments. Then what you need is time and effort to do the work. That would be replication. Simply checking every detail of a calculation is not replications. Come off it! The fact that those are no longer available is irrelevant. Why didn’t your “science team” which “wishes to remain anonymous” actually get stuck in and do the work? Why did the instead publish a claim that adjustments were not required and that our scientists were dishonest in applying them? I imagine this will be one of the hard questions you face in the High Court. Your failure to do that work could well lead to the awarding of exemplary costs for maliciously bringing the case. Since it’s so easy, would you kindly replicate Jim Salinger’s adjustments to the temperature readings? Include all your workings and decisions. For extra credit, provide reasons for each adjustment; although, since Salinger failed to do this, or at least record that he had done it, you’ll suffer no penalty if you don’t. Note that “replication” does not mean “copy from the spreadsheet”; it means starting from scratch. Do you have citations for those publications? Do you have recommendations as to which among the “different methods” one should choose? As to your claim that we asserted “that adjustments were not required and that our scientists were dishonest in applying them” do you have a reference? I can answer this question for Ken. You imply that adjustments are not required by using the graph at the top of this page showing raw data as a time series. 1. You might take an inference as to my meaning, but I did not imply it. Indeed, by asking NIWA for the adjustments, I explicitly acknowledge the need for adjustments. 2. An implication is not an assertion, which Ken alleges. 3. If you hold to this criticism, it will hit NIWA equally. 4. Ken has hitherto referred to an alleged assertion in our paper, Are we feeling warmer yet, and I think that he should cite a reference in that. I’d be interested to know if you agree that the simplest definition of a time series is (raw) data observed over time? And whether “adjustments” are necessarily required to “raw” data? “The raw data set you have shown comes from many different sites in different temperate locations”. Rubbish. The red line is NIWA’s 7-station series. The green line is exactly the same 7 stations – there is no variation in time or space. The sole difference is that the green curve omits NIWA’s in-house alterations to the historical data. Have a look at NIWA’s 11-station Series. That is made up of raw data which comes from many different sites in different temperature locations appended together as a single time series. But in that case, it is a different mix of stations each year. NIWA compares a predominantly North Island dataset in 1931 with a dataset dominated by offshore islands in 1941, with a predominantly South Island dataset in 1951. Now that’s what I call “a total nonsense”. yes, the same site data is permitted to be plotted as a raw uncorrected time series, otherwise i don’t think it makes sense.